DELL Dell Leather Sleeve - XPS 11"
Dell Leather Sleeve - XPS 11"The Dell™ Leather Sleeve - XPS 11 is custom-designed for a perfect fit with the Dell XPS 11 Ultrabook. The sleeve features premium Italian leather outside with a soft-lined interior that helps protect your XPS 11 from scratches. An integrated stylus holder provides added functionality and a magnetic closure helps keep your laptop safely inside while on-the-go. 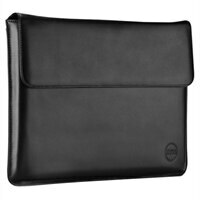 The Dell™ Leather Sleeve - XPS 11 is custom-designed for a perfect fit with the Dell XPS 11 Ultrabook. The sleeve features premium Italian leather outside with a soft-lined interior that helps protect your XPS 11 from scratches. An integrated stylus holder provides added functionality and a magnetic closure helps keep your laptop safely inside while on-the-go.